I know it doesn’t sound like a meal, but have you seen the size of the potatoes in the grocery store? They are massive! Paul and I try to keep a couple in the house for those days when we don’t feel like going out, but want to put little effort into cooking. After washing/scrubbing the potatoes, we wrap them in foil and throw them in a 400 degree oven for an hour and a half. Perfect potatoes every time. If you don’t want to wait that long, before foiling said potatoes, you can throw them in the microwave for about five minutes or so. Then pop them in the 400 degree oven for about half an hour. I have trouble gauging the correct microwave to oven ratio for cooking times, so I just stick with the oven method. A potato in and of itself isn’t really a meal. It’s all about the toppings. My go to toppings are shredded cheese and salsa. It’s like a potato nacho. Paul prefers cheese, butter and bacon bits. Not the fake ones, but there are some that come pre-chopped in a bag. These are all things we just keep in the fridge on a regular basis. Sour cream is always a good option too, pretty standard. I’m always looking for new potato topping ideas that might already be sitting in my fridge or cupboard. Also, depending on your toppings, this meal isn’t that bad for you. 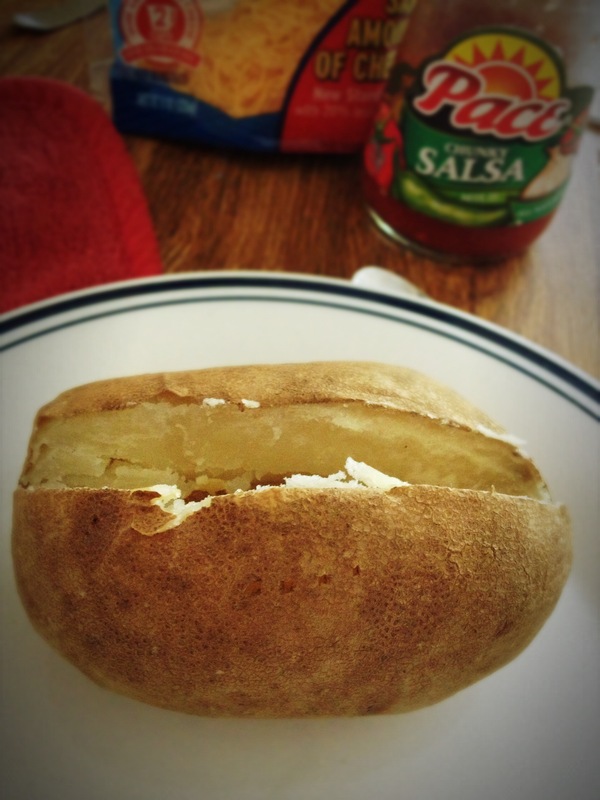 If you have frozen veggies, you can steam them and throw them on top of your potato. Herbs and spices are also a good additive and they don’t add calories. Most people have an onion hiding in their fridges. Chop it up, and sprinkle on top. Please don’t ask me if a potato is gluten free. I’m not a scientist and you have Google for that. Yes, potatoes are gluten-free. Some of the toppings might not be, but by themselves they are. You can bake the potato totally in the microwave. Scrub it and puncture fork holes all over it. Soak and wring out a paper towel in water. Wrap and throw potato in microwave. If yours doesn’t have a “potato” button I usually start at 5 minutes then in 2-3 minute increments. Constantly checking the towel and rewetting if needed. Press thumb against potato to see if cooked (you’ll be able to press thumb into potato easily when its done). Usually done in no more than 10 minutes, depending on size. The towel keeps the potato moist and won’t dry out. Good for quickness and hot days you don’t want to turn on the oven. Leftover chili, stew, or shredded chicken from slow cooker are all amazing toppings for potatoes!